Parkinson's Disease is an incurable disease that affects roughly 7-10 million people worldwide. It is most commonly associated with tremors of the hands but can also cause other debilitating forms of motor impairment. It is caused by degeneration of dopamine-producing neurons. Dopamine is a chemical messenger responsible for communication between the brain and muscular systems in the body; without a sufficient amount of dopamine in the brain, smooth and purposeful movements eventually become obsolete. 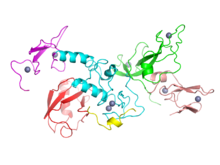 The crystal structure of Parkin, a protein that has been linked to Parkinson's. Neurological disease researchers at the University of Pittsburgh and the University of Pittsburgh School of Medicine are preparing to undergo clinical trials to test a treatment which may reduce the motor impairment symptoms of those suffering from this disease. Their treatment focuses specifically on reducing dopamine loss. As neurons affected by the disease degenerate, they produce less and less dopamine. Current treatments for Parkinson's include administering manufactured Levo-Dopa (L-DOPA), a precursor to dopamine that is naturally produced in the body. Since this L-DOPA is then converted by the body into dopamine, this can be effective in suppressing certain symptoms for a time. Unfortunately, eventually the effectiveness of L-DOPA decreases. “Less dopamine is made as the neurons degenerate, and one reason is that there is a decrease in an enzyme needed to turn levo-dopa into dopamine. By inserting the gene for this enzyme into cells in a specific part of the brain, we hope to make levo-dopa treatment more effective for a longer period of time." This enzyme, aromatic L-amino acid decarboxylase (AADC), can be administered by means of a harmless virus through a catheter insertion in the brain. Once the enzyme reaches the affected neurons in the brain, the hope is that a chain reaction will begin and produce more of the enzyme and subsequently increase the levels of dopamine while L-DOPA is already in the body. Clinical trials for this study are slated to begin soon and may lead to very promising treatment options for the millions of people suffering from this currently incurable disease. Laboratory and chemical supply companies interested in marketing laboratory supplies to active researchers at this multi-million dollar institution are encouraged to participate in the 17th Annual BioResearch Product FaireTM Event on June 16, 2016. Last year, this event attracted 273 attendees. Of these attendees, 51 were purchasing agents, professors and post docs, and 41 were lab managers.